In my first post I put the measurements of the ones we used here. They are smaller then 1 7/8 but slightly larger then 1 3/4. The non “equal length” versions I’m not sure about. Maybe someone who has a set can measure, all the ones I saw were larger. Any quality high flow catalytic converter for these headers? Also all of the ebay versions are 1 7/8 anyone running 1 3/4? Im using flowmasters high performance cats with mine. I think Ronan is using the same ones. They might be discontinued though so you might want to check magnaflow as they have some you can weld in. My headers and cats combined were less than those mids. The exhaust shop even had to redo the flanges that were welded on the cats and hook them up to the rest of the exhaust for less than the cost of those mids. Point is, those are expensive. I didn't even look at the price...jeeesh. I was too busy looking at the rear O2 bungs. I'm not sure there's enough clearance where they are. 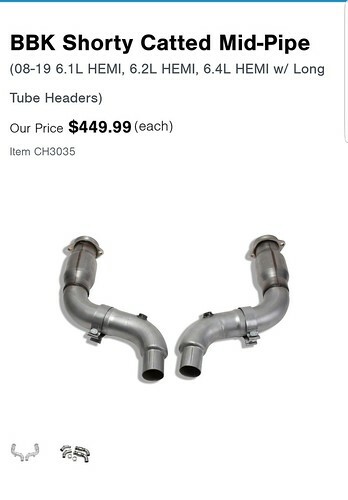 Still cheaper than buying a name brand set of headers. How are you liking them so far? 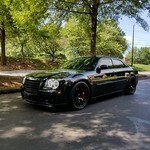 Best thing I've done to the car. The sound is just awesome. Be glad when the roads warm up and the tires start to stick a little better. Below 50 is like driving on ice. Might be a dumb question, but do you think these will fit on a '16 Challenger 5.7? Dumbest question any Cali guys get these shipped to California?